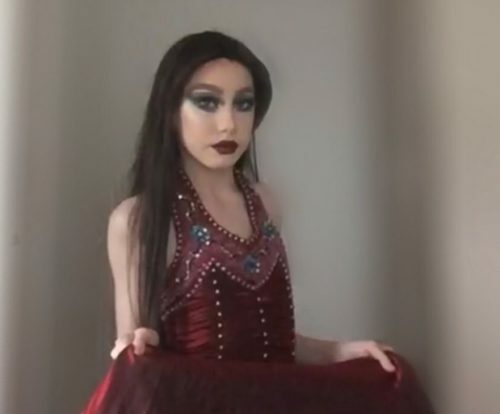 A school talent show banned a teen from performing in drag. Now he’s going to be famous. A teen who was told by his school that he couldn’t perform in drag will now be at DragWorld UK, Europe’s largest drag convention. Lewis Bailey attends the Castle High School and Visual Arts College in Dudley, England. The 14-year-old came out to his parents a year ago. For his school’s talent show, he wanted to perform as Athena Heart, a drag character he made up. But his teacher said that it was “illegal” to perform in drag. “One of the teachers told him he couldn’t do it any more because the law that says you can’t do competitions as a drag act if you are under 18,” Lewis’s mother Natalie said. The school has not specified what law it’s referring to. Natalie said that Lewis’s act was age-appropriate: it’s a lipsync to a medley of songs that were censored for language. But now he’s going to perform at DragWorld UK, “Europe’s largest celebration of drag,” alongside some of the biggest names in drag like Violet Chachki and Courtney Act. The convention’s website promises that Athena Heart will perform “the very routine his school banned” in London this August. “I’m very excited about my DragWorld invite to perform and get my name out there so others just like me know that it’s ok to be different,” Lewis said. He’s the only drag performer on DragWorld UK’s front page who didn’t compete on RuPaul’s Drag Race.